Using a combination of Lawn mower, hand shears and long handled shears, I managed to get the first cut done of the year. It took me HOURS! I had left it far too late…the grass was far too juicy and long. But eventually….. I had to remove the slope at the front of one of the seats as it sent us leaning at a dangerous angle towards the water. I think I’ll just push some grass seed in to it next week. The weather in our parts has been cold lately and wet and very very grey. But it hasn’t stopped things growing and I noticed today that quite a lot of growth has happened in the past few days while I haven’t been looking. 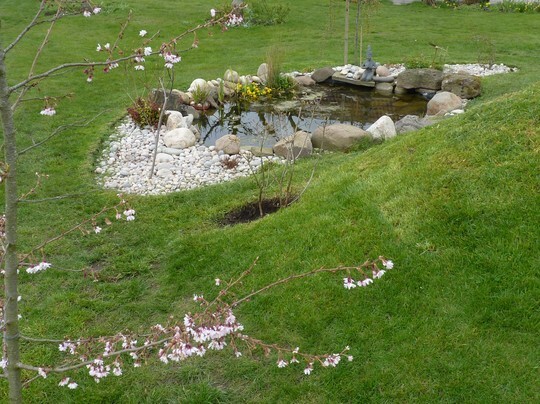 Even my water Hawthorn has sent up it’s first pure white flower in the pond. As Usual, the terrible duo had to be in on it all…. Previous post: Monifieth to Broughty Ferry Castle - a sunny stroll. Next post: Six Dwarf Rhododendrons for less than £30! Don't your backsides get damp sitting on your grass seats? They could be dog baskets! I like. All looks great Karen. Cold here too but was sunny yesterday, alas I was at work. These winters drag on, don't they. Dogs are happy ? 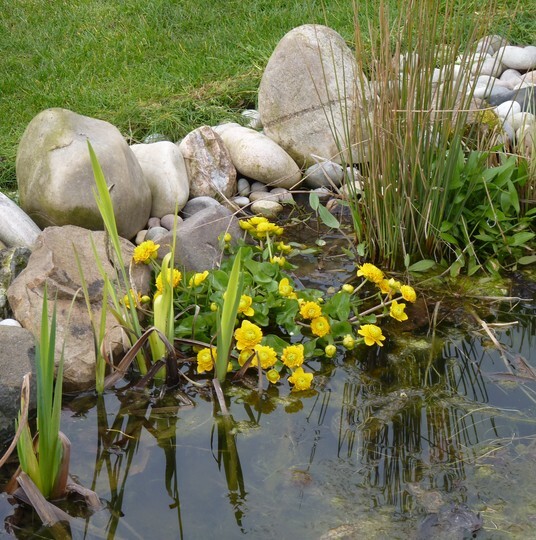 pond looking g great, marsh marigolds invaluable, so bright. Siris...whats a damp backside when you're enjoying a glass of wine gazing into your pond?! And also...I have cushions! Thanks Dawn! Yes, drag on they do. It beats hawking a deckchair round to the pond side and risking tippling in with your tipple. I love sitting on our steps by the pond and watching the reflections of the sky in the water and the fish swiming around. 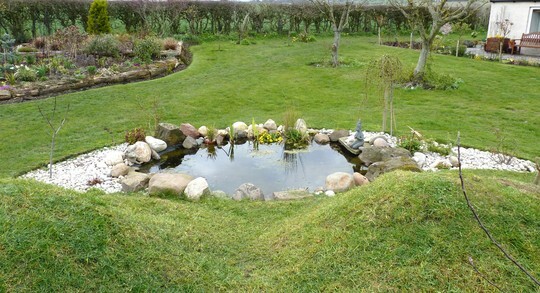 Your pond looks very well established already. 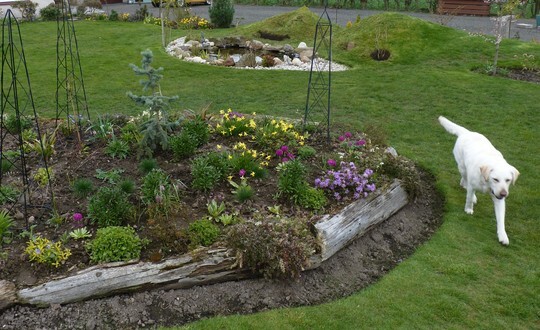 Very nice choice of plants. 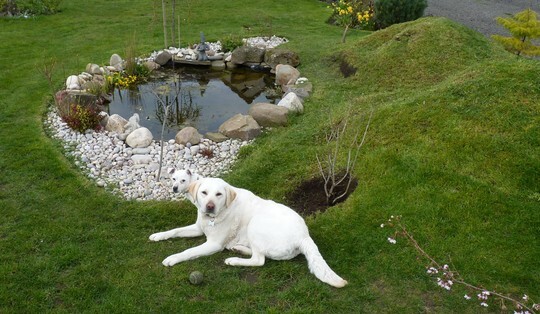 LOL, I had to scroll back up to look for the two-headed dog, I had seen them enjoying being in the garden but hadn't taken any notice that Molly's body is hidden in one of the pics, it looks grand Karen and isn't it a good feeling to get the first cut out of the way. Ha ha....I'm sorry Karen but I just keep picturing you being ejected from the lawn seat into the pond.......sorry! I have to admit, I had similar visions to Paul's! Especially after a couple of glasses of wine! 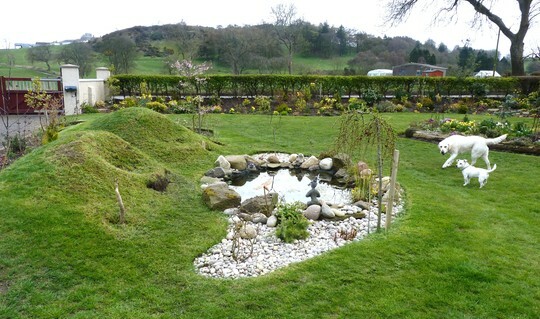 It all looks lovely - hope the weather cheers up! I dont know Karen but, watch you dont croak...if you end up face down in ther pond!